Super raw ingredients. Anti-inflammatory / antioxidant. Lattes & smoothies + granola + bakes. Plant based. Gluten free. 100% vegan. Vegetarian Society Approved. 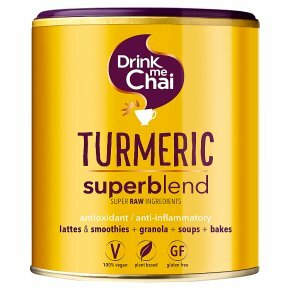 Turmeric is recognised for its powerful anti-inflammatory, antibacterial & antioxidant properties. Our golden mix of natural ingredients is designed to release the full healing potential of turmeric in an uplifting, subtly spiced blend.